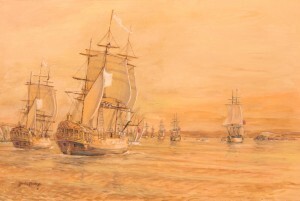 Laperouse and the First Fleet, of painting, “Botany Bay” adding the “antique ” feel to a painting. Painting measuring 61 x 91 cm (24″ x 36″), Oils, available, £3,000. in the usual way. I was going to complete at the time I was working from Castelnau de Montmiral. Several people I highly respect, familiar with my work, saw the painting and cried ‘stop’, don’t do any more !!! So I added a minimum of additional colour and detail, I tidied up and stopped. Viola! Thus it is a rare marine example of what I often do with landscapes; a mentor of mine, Francis Pratt (Painting School of Montmiral) calls, power in then stop. Meaning often in my case the first raw impressions are best. By one of life’s mysterious coincidences Laperouse arrived at Botany Bay the same day the First Fleet departed to settle at Sydney Cove. The voyage of Laperouse, that is Jean-François Galaup de Lapérouse, with Astrolabe and Boussole was literally the French response to the discoveries of Captain James Cook, discoveries that were a major sensational in 18 th century Europe. The British considerably assisted Laperouse, the relationship was very cordial. My special thanks go to The L’Association Lapérouse, Albi, France a small museum well worth your time to visit in the UNESCO world heritage town of albi, Tarn province, the staff of the UK Hydrographic Office and to Mr. Stephen Best. A tribute to Jean François de Galaup, comte de Lapérouse of Albi, and his men. Awesome… there I was in the UK Hydrographic Office, Taunton, I’d been passed by the armed guards, met by Guy Hannaford, I was holding not any chart, the original chart of Botany Bay drawn by Captain James Cook. The same chart that drew the First Fleet of British settlers and the French voyage of scientific discovery commanded by Laperouse. How many lives have been changed because of Cook’s discovery of Botany Bay and his charts ? My voyage had started in conversations with Stephen Best when we were both living at Castelnau de Montmiral in south west France. Stephen had visited the Musee de Laperouse in nearby Albi, a small beautiful, fascinating museum well worth a visit. Stephen who has travelled extensively around ‘Polynesia’, the Pacific, became very interested in the voyage and mysterious fate of Laperouse. Following a visit to the museum I too became ‘infected’ with his enthusiasm so I joined L’association Laperouse to learn more. The museum staff and members of L’association Laperouse could not have been more helpful. However I soon realised most of the splendid models and all the paintings of the ships Astrolabe and la Boisselle were historically incorrect as is some of the info on Wikipedia. Meanwhile Stephen and I discussed possible subjects for a ‘Laperouse’ painting. Easter Island featured high on our list. I even came up with a plausible theory as to why all the bays on Easter Island have local names except one, Laperouse Bay. However eventually we settled for Botany Bay for three main reasons. 1, We both have Australian connections (in my case via other paintings). 2, By a huge co incidence and keep in mind at that period there were very, very few European ships in the pacific Ocean, in those days such a voyage was not unlike going to the Moon today, Laperouse arrived at Botany Bay the same day the First Fleet were leaving to settle at Sydney Cove, Port Jackson so the ships and people actually met. 3, When after a three month stay which included very conginial relations with the British Laperouse ships sailed out into the wide Pacific Ocean never to be seen again. Finding images of the ships of the First fleet was easy, they are well documented, not so ‘Astrolabe’ and ‘la Boussel’. We knew where the ships were acquired (both second hand merchant vessels), their dimensions and where they were prepared for their long voyage (Brest). What no one knew was the true appearance of the ships, no plans or contemporary paintings are know to exist. Burrowing more deeply I discovered at various times ships officers had included the ships in what looked like casual personal souvenir drawings of bays were the ships had anchored. The drawings were small (I found a way round that problem), of poor quality (probably the officers were not very interested in the appearance of their ships which to them were very ordinary) some contained errors, other gave very useful information to anyone familiar with French merchant ships of the period. I quickly made myself familiar with French merchant ships of the period ! It soon became clear one of the ships was note worthy having a stern by then old fashioned, a some what ‘galleon style’ stern, more note worthy because the design was clearly not an English of Dutch or other North European style. Botany Bay presented another challenge, what did it look like and more particularly in those far off days ? Where were the ships in relation to each other ? By great good fortune I found an ally at the UK Hydrographic Office, a secure government building meaning not open to the public, in Taunton, Somerset. Guy Hannaford generously invited me to visit. Now the title UKHO may seem rather dull… believe me it is not a dull place at all. On the 6 th of November 2009 I drove to Taunton for what was to be an incredible day at the Admiralty Hydrographic Office research department. I was soon looking at period drawings of Botany Bay (Laperouse) and Gibraltar (Nelson) for 2 marine paintings, charts and watercolours made by ship captains of the period, still preserved in pristine condition. The British can thank the Dutch for their splendid ‘Admiralty Charts’ widely considered even today the best of the best. The history of chart making is a long one. Many of the early ‘renaissance’ best charts were made by Jewish people. The Hydrographic Office traces it’s beginning to the late 18th century as a department and it’s origins I was told, to the Dutch raid on the Thames and Medway. During that attack the Dutch navy successfully navigated the difficult Thames Estuary river Medway to destroyed or carried off an embarrassing amount of British naval property. Later during the recriminations a very angry King Charles asked how was it possible and the answer was – charts. Did the English have charts was said to be King Charles next question and no was the answer. Buy Dutch charts was the Royal command! Incidentally, King Charles II introduced the Dutch marine artist William van der Velde to London as his official marine artist thus establishing a tradition of British marine painting to which logically, I am an heir. The ‘Merry Monarch’ also introduced the sport of yachting, some thing else many of us love in common with King Charles II. I found with Guy’s help most of what I needed including some amazing 19th century and even earlier, one dated 1770, drawings and charts. I found myself allowed to handle original documents, awesome or what ? To follow that using dairies and ships logs it was relatively easy to establish the composition you can enjoy in my painting which needs a home, « Laperouse and the First Fleet », enjoy. The ships of Laperouse Astrolabe and La Boisselle were on a voyage of scientific discovery at a time when very few Europeans had entered the vast Pacific Ocean. The Laperouse voyage was litteraly the French response to the voyages of Captain James Cook. 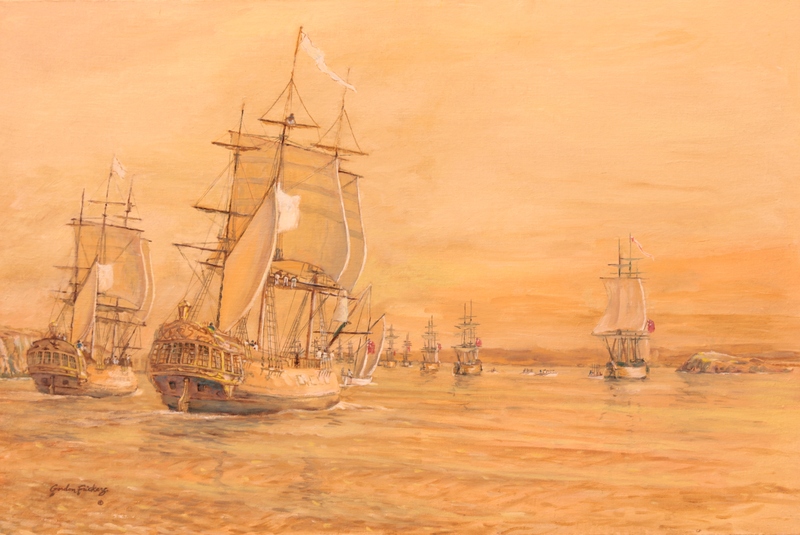 Following James Cook’s directions Laperouse encountered the First Fleet at anchor in Botany Bay and about to sail as they prepare to move to Port Jackson to start in earnest a colony at a place they named Sydney Cove. Laperouse departed Botany Bay on 10 March 1788 never to be seen again. In 1827 Captain Peter Dillon found possible evidence the men of Astrolabe and La Boussole at Vanikoro Island in the Solomon Islands group. Local people said two ships had been wrecked in a storm. Survivors had constructed their own small boat and sailed, never to be heard from again. Most of what we know of the voyage results from recent archaeology including dives at Vanikoro and because Laperouse gave much scientific information to the Russians and at Botany Bay to the British who faithfully conveyed the material to Paris. Gordon Frickers worked from original source material including, special thanks to the UK Hydrographic Office including for access to the chart drawn on Cook’s voyage, to the staff of of the musee de Laperouse in Albi and members of L’association Laperouse. You could acquire this work of marine art or commission a painting like this. Best value, buy from a dedicated artist- buy from a reputable, dedicated, established artist direct from his studio.